About this time of year, when I have had my fill of roasted squash, green beans, mushrooms and all of the flavors of fall and winter, I get a craving for the brighter flavors of spring. This dish satisfies that craving perfectly. Risotto, a classic Italian dish where a short grain rice is cooked slowly in broth, is a wonderful and versatile vegetarian main course or a great side dish. Once you have the basics of risotto-making, you can use risotto as a venue for all kinds of vegetables and vegetable combinations. Mushrooms and spring vegetables are common themes for many risottos, but you can certainly branch out and get creative. 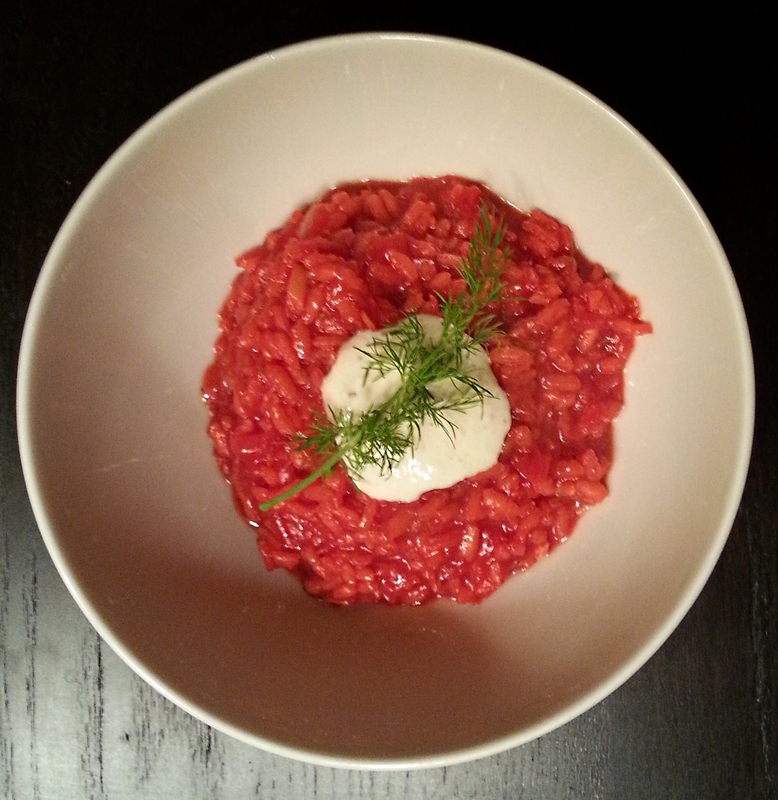 I love making a carrot and ginger risotto with coconut milk, or (as below) a beautiful red beet risotto. Fall in a bowl! This is a great way to use seasonal squash and apples. 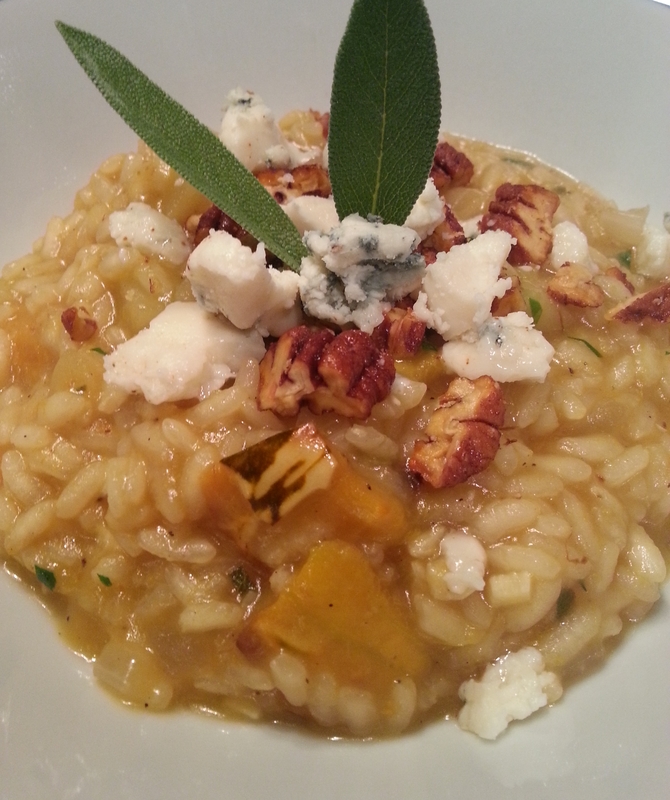 The blue cheese and spicy pecans add a layer of complexity and purgency to the mildly sweet risotto. I like the more delicate flavor of delicata squash, but butternut squash would work in this dish as well. Toss squash with olive oil, salt and pepper and roast for ~20 minutes until lightly browned. In a medium to large pot, heat broth on low heat. Heat remaining 1 1/2 TBSP olive oil or butter over medium heat in dutch oven or large deep pot. Add onion and apple and sautee for ~5 minutes until moisture is released and onions begin to soften. Add garlic, sage, salt and pepper and sautee for another minute. Add rice and stir to coat grains with oil and lightly toast - about another minute. Add white wine to deglaze pan. When most of the wine is evaporated, add one ladle of broth and stir until most of the liquid is absorbed. Continue adding broth, one ladle at a time, stirring very fequently. Continue to cook and stir, allowing the rice to absorb each addition of broth before adding more. After 10 minutes, add roasted squash to risotto. After 15 minutes of adding broth and stirring, taste rice for doneness. Rice should be cooked through and the starches in the rice should create a creamy texture. 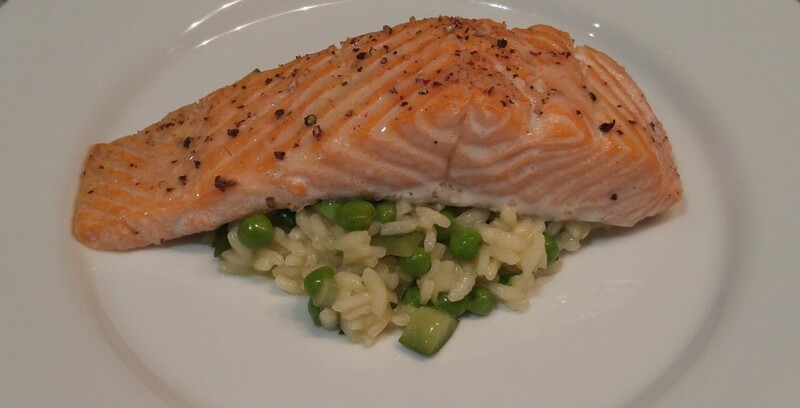 If rice is still too firm, continue adding broth until it is cooked through, if you run out of broth, you can use water to finish off the cooking. When risotto is done, serve immediately topped with blue cheese and pecans.